The Central Park Apartment is located close to the famous Central Park, the destination by itself when in New York City. You will be staying on the Upper West Side of Manhattan, and that really opens up the city to you, no matter whether you're there to work, attend school, or take in the world famous sites, they will all be within easy reach for you. Recently totally renovated, Central Park Apartment offers variety of great studios for rent. 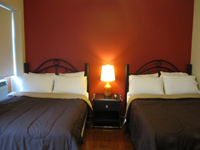 Furnished studios are with private baths some offer kitchenettes, some are with full kitchens. Subway stop on the corner makes the transportation quick and easy. As with Union Square Inn most amenities are complimentary.